Late goals by Shaun Miller and Charlie Wyke earned Carlisle a sensational 3-2 comeback win over Exeter. 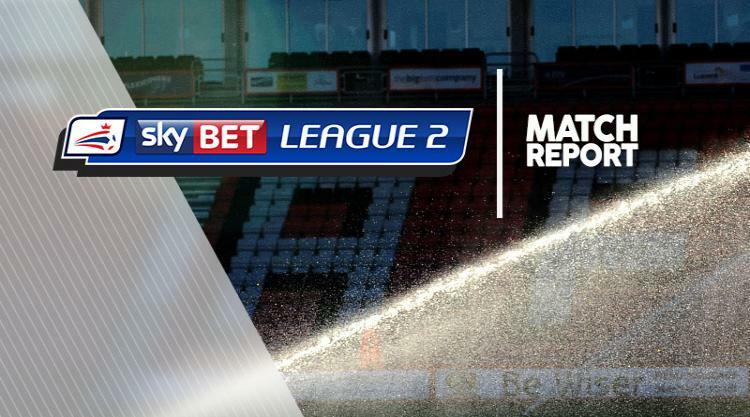 Goals from Reuben Reid and Lee Holmes looked to have earned Sky Bet League Two strugglers Exeter the points after Wyke had equalised for Carlisle early on. But it was substitute Miller who finally got the home side back on level terms again with his 89th-minute strike before Wyke won it deep into added time. There was a dramatic start to the game as Reid gave Exeter the lead after just 40 seconds, holding off Shaun Brisley inside the area to squeeze the ball past goalkeeper Mark Gillespie. However it did not take Carlisle long to draw level, Wyke getting in at the near post in the 10th minute to power a header past Christy Pym from Danny Grainger's cross for his seventh goal of the season. It may have been a clash between second top and second bottom but if anything Exeter were the better side in the first half and Pierce Sweeney came close to restoring the Grecians' lead when a block by Grainger prevented his close-range effort finding the target. With Lee Holmes forcing Gillespie to save smartly by the keeper's right-hand post following a free-kick, Carlisle were looking uncomfortable in defence although Luke Joyce and Mike Jones had chances for the home side in an open contest. Carlisle were caught napping by a ball from the right that ran across the six-yard line to Holmes who was on hand to slot the ball home and restore City's led in the 54th minute. The Cumbrians threw all their attacking options forward and Miller got on the end of a ball from Nicky Adams to head past Pym before Wyke thrashed the ball home from close in to make it 3-2 in the sixth minute of added time. Miller was given a second yellow card seconds from the finish.